Because of the stiffness of the web it is hard to generate a certain vibration by the web cleaning device. This vibration can be helpful with some types of substrate as it generates movement of unwanted particles towards the cleaner. On the other hand, this stiffness offers the possibility to raise the force of the airflow to increase cleaning capacity without the risk of instability, or the web being drawn on to the cleaner’s face. Another challenge is the large number of combinations and flute sizes corrugated board consists of, from a thin and flexible single wall to a thick and heavy triple wall with the flexibility of a wooden plank. The web cleaning process of Weducon functions as per the scheme hereunder. Boundary layer dragged by the moving web, covering debris, dust and foreign particles. This layer is absorbed by the cleaner including the unwanted particles it covers. 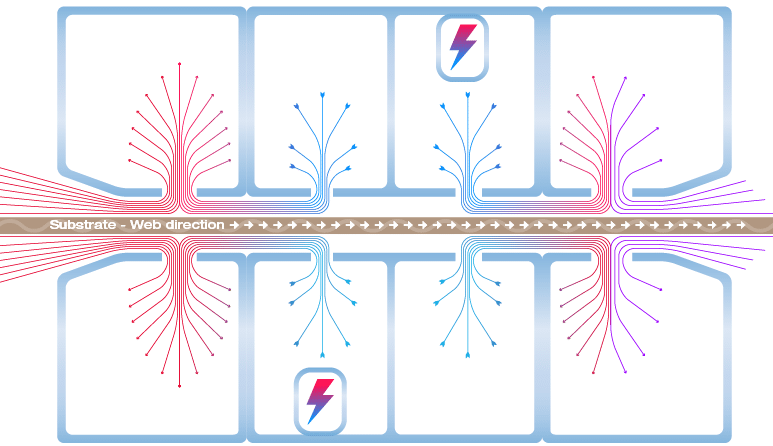 24 V DC anti-static devices generate a strong compensating field of both positive and negative ions settling the static charge in the substrate. The neutralised web does not attract dust directly after the cleaner. Conditioned, clean air from filter/fan unit in semi-closed loop stabilises the web and sweeps the contaminated surface. Drawn air from direct surroundings behind the cleaner. No boundary layer present yet. The airflow marked with the blue colour depicts overpressure generated by the filter/fan unit. This layer of air supports the web through the cleaner without mechanical contact. As the flow of pressurised air is approximately 70 % of the total volume, the vacuum side is stronger. This allows the total blown-in volume to be absorbed by the vacuum chambers as well as air drawn in from outside of the cleaner. As the entry of the cleaning device is angled, the boundary layer that is generated by the web is absorbed by the cleaner, together with dust and debris. The blowing chambers of the web cleaner are on both sides of the web equipped with strong 24 V DC ion generators. These ionisers have built-in high voltage power supplies, give real-time feedback on performance and failures and have protection class IP66. The unique designed slots in both pressure- and vacuum chambers prevent accumulation of debris and fibres, lower noise and improve aero dynamical functionality. Mechanical features, such as the coupling of the profiles using exclusive clips, the design of the slots and measures to prevent bending and deformation provide additional performance enhancements. The die-casted hose connections contribute additionally to both aerodynamical improvements and lowered noise. The Corrucleaner® HE 90 has unique features putting it in a class of its own as the web cleaner for corrugated board. Some of these features are very specific, and only applied in the Corrucleaner® configuration. For instance, the height adaptation of the cleaner allows for a wide variation of flute sizes and combinations. The cleaner will always operate in its optimal window. The use of Festo® multi-step cylinders enables a step-by-step adaptation of the space between the two sides of the cleaner. These cylinders are controlled by the standard interface that contains all pneumatic and electric components. The interface links the cleaner, the filter/fan unit and the corrugator. Control options: manual, through corrugator-generated impulses or as a stand-alone system with the support of our optional AIG (autonomic impulse generator). The AIG measures the thickness of the corrugated board, reacts on order changes, opens and closes the cleaner head, starts and stops the filter/fan unit and guarantees optimal use of the Corrucleaner®. 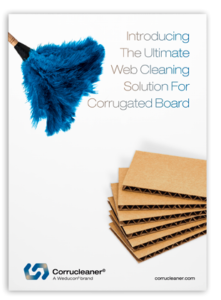 Of course there is a lot more we want to tell you about the Corrucleaner® and why it is the most effective web cleaner for corrugated board. But maybe you want to tell us about the challenges you experience to keep your customers happy and to run your corrugated production smoothly. We would love to hear from you. Get in touch.